It's an ironic twist in President Donald Trump's desire to secure the U.S.-Mexico border by building a $5 billion wall and send people through established ports of entry. Democrats say they would support additional border security but have balked at wall construction, resulting in a 24-day government shutdown without any end in sight. 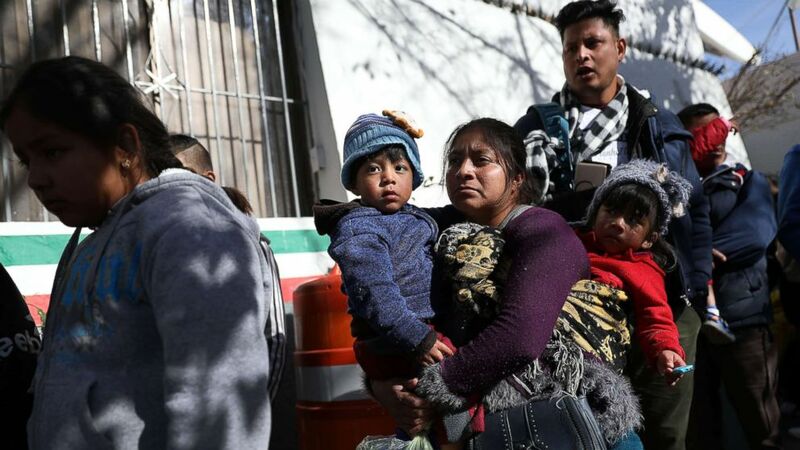 (Joe Raedle/Getty Images) A group of people, some journeying from Honduras, Mexico, Cuba, and Guatemala wait to cross the Paso Del Norte Port of Entry bridge to turn themselves in to the U.S. Customs and Border Protection personnel for asylum consideration on Jan. 13, 2019 in Ciudad Juarez, Mexico. “The stress on the immigration court system will only increase as backlogs continue to skyrocket due to the shutdown," Reichlin-Melnick told ABC News. As we enter Week 4 of the shutdown, the non-detained immigration courts, which hear over 90% of all cases, have now been shut down for thirteen days. Since the shutdown began, at least ~6,500 cases have not been completed that otherwise would have been. 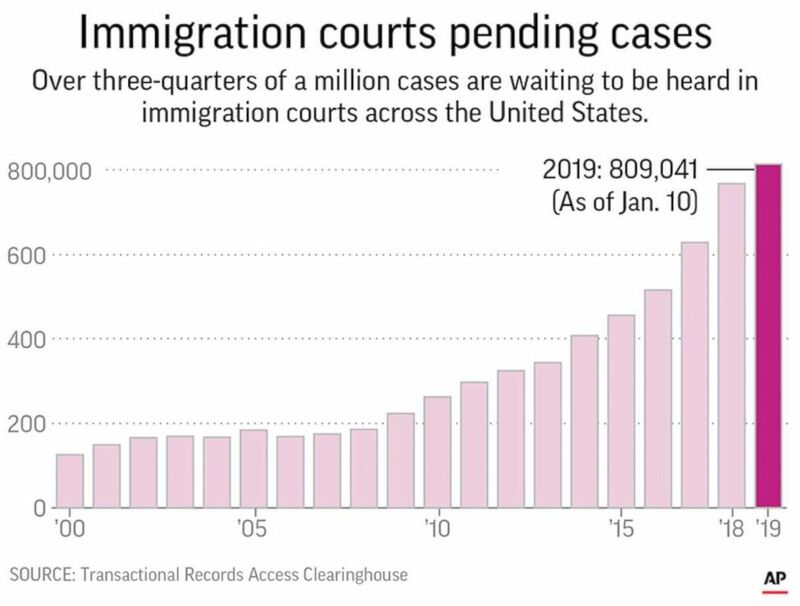 (AP) An AP graphic shows the backlog of cases in U.S. immigration courts. The estimates are based on the average number of court matters typically completed when the government is not shutdown. After the shutdown began last month, court proceedings stopped for anyone who was not detained by U.S. authorities. Cases for detained immigrants were allowed to continue under the Justice Department’s shutdown plan. Many people, particularly those traveling with children, would not necessarily be detained for long periods of time unless there was evidence of other criminal activity. The shutdown also creates a paperwork backlog, as courts for non-detained cases are not open to receive key documents from lawyers. That includes case documents to help asylum applicants prove their right to stay in the U.S. In addition to the impact on cases, the judges who were scheduled to hear cases are feeling the strain of growing uncertainty and not getting a paycheck. Judge A. Ashley Tabaddor, President of the National Association of Immigration Judges is worried about the financial hardship for hundreds of her colleagues working without pay. 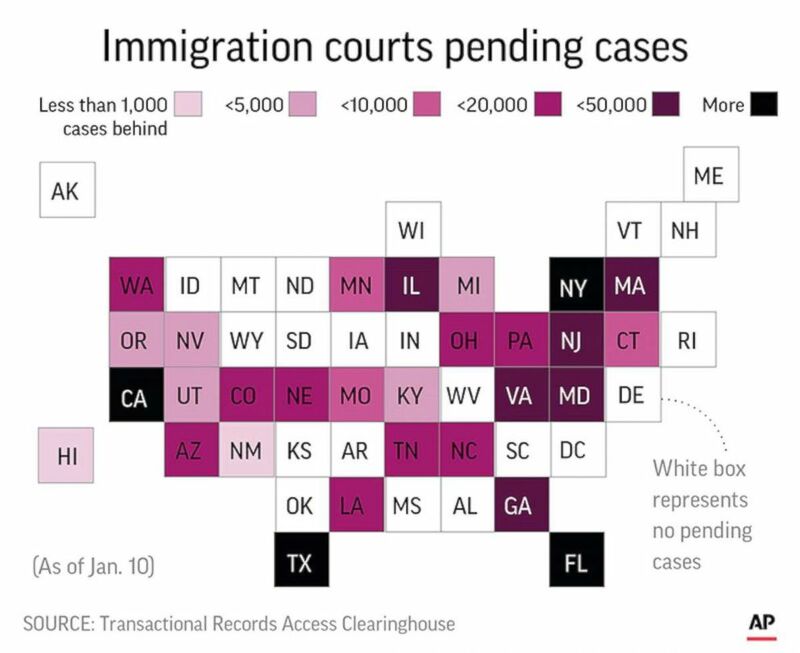 (AP) A graphic released by the Associated Press shows the number of pending cases in immigration courts across the United States. For many immigration judges, the decision to enter public service is already a sacrifice, Tabaddor said. They typically carry academic credentials that could give them the opportunity for much higher paychecks in the private sector. Financial problems are a common cause for the government to deny security clearances. Judges could face difficulty in passing their ongoing background screenings which aim to ensure they’re not at risk of defaulting on debt.